Good morning PinkWhen readers! This is Brandy from BD Design Blog and today I’m sharing this darling Fall Mantel Craft with Blocks to spice up your mantel (or bookshelf) this season. I love decorating with blocks because it gives the space you are working with dimension and texture. For this craft, I used glitter, ribbon, and a drawer pull to dress up these simple Fall blocks and I loved how they turned out! 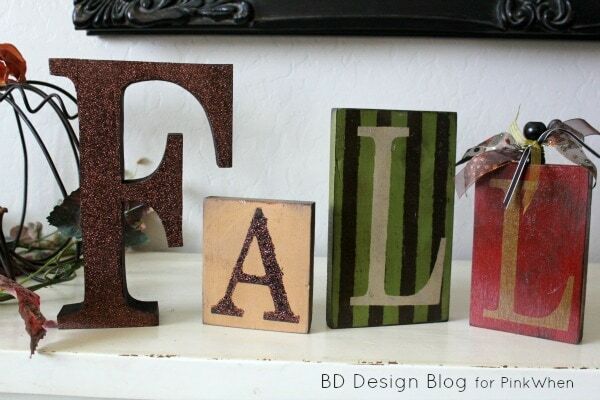 This Fall mantel craft with blocks is super cute and easy to make. Follow below for all of the easy instructions on how to create this super cute Fall mantel craft. 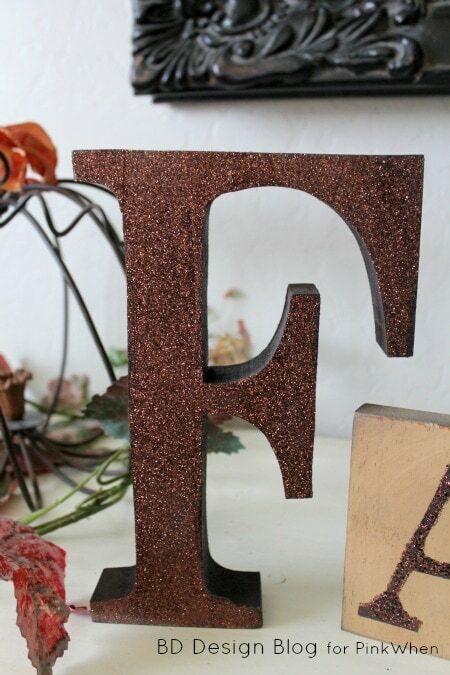 the letter “F” made from wood. You can get this at any local craft store. Start out this project by cutting the 3 blocks of wood in the dimensions mentioned in the supply list. 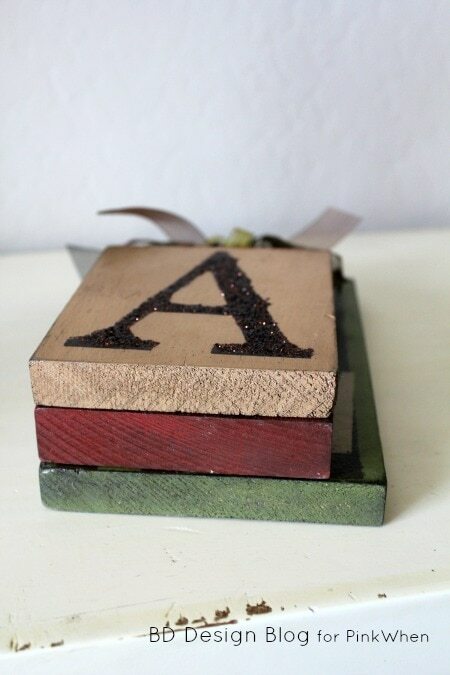 Paint the blocks with the tan, burnt orange, and green paints. This is when you can get creative! Use stripes, polka-dots, or shapes to decorate the blocks. After the paint dried, I used a piece of fine sandpaper to distress the edges. 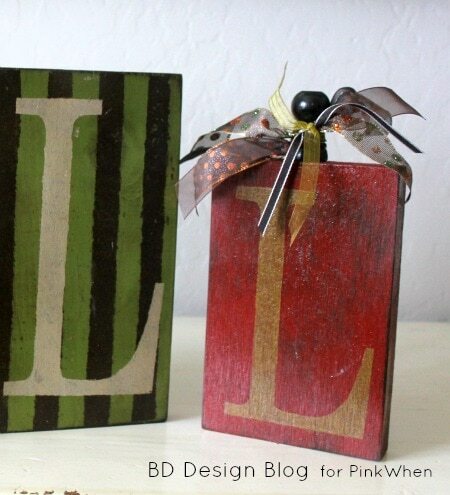 Now it’s time for you to stencil on the letters A-L-L to the blocks using a stencil brush. Make sure you blot your brush on a paper towel before applying to your wood so that it doesn’t bleed under your stencil. Paint the “F” a dark chocolate brown. Once it is dry, cover the top with Elmer’s glue and sprinkle the brown glitter over the glue. If you want a little more sparkle like the picture, use the same technique for the block “A”. To finish this look, I attached a cute bronzed drawer pull to the shorter “L” block and tied a few different fall colored ribbons. That’s it! These blocks came together quickly and they were so fun to make! I hope everyone is enjoying this wonderful season! You might also like this DIY Rag Banner or this Framed Snowflake Ornament.